Machined Dural-Aluminium base with adjustment and five prop shaft holders. A very well made tool from UMM-USA that does the job for which it was designed. 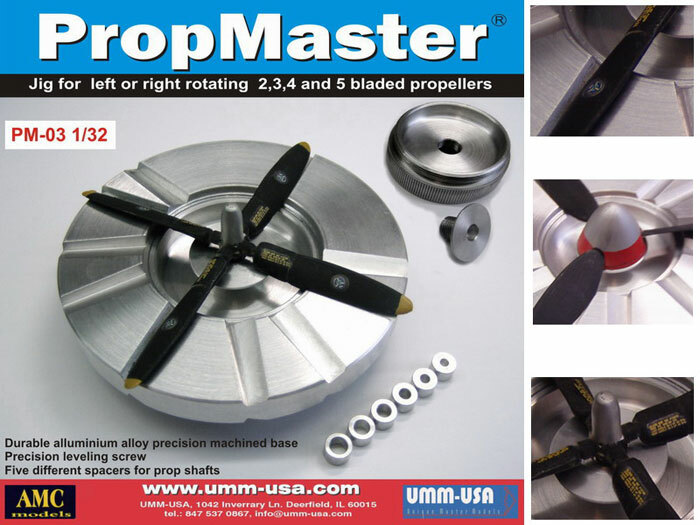 An easy way to get prop blades set, especially for multi-engine aircraft. Following the successful introduction of the PropMaster for 1/72 and 1/48 scale (which were reviewed previously here on Hyperscale), UMM-USA brings us a monster with the introduction of the PropMaster for 1/32 props, which can also be used for large and five bladed 1/48 props. This 1/32 PropMaster measures about 4.5 in. / 113 mm. in diameter and weighs in at about 11 oz. / 311 gm. But, unlike the smaller scale PropMasters, this one can accommodate up to and including a five bladed prop. On one side of the PropMaster the groves are set for a clockwise rotating prop, the other side is for a counter-clockwise rotating prop. To change direction, you merely unscrew the central platform and flip the PropMaster over and screw in the main platform. The appropriate grooves are numbered on the side. If you have a three bladed prop, you use the grooves numbered “3”. The grooves are machined at an angle to represent what appears to be the maximum pitch of the blade. The instructions indicate that you can set the pitch of the blade by using the PropMaster, but I’m not sure how this could be done, other than by simply holding the blade at a pitch you want while the glue sets. All the grooves appear to me to be at the same pitch. In the center is an adjustable platform with a well in the center and a screw head on the backside. By turning the screw, one adjusts the height of the platform to achieve a level set for all the blades. The PropMaster comes with six inserts that fit within the well of the platform. Each insert has a hole in the center of a different diameter to accommodate the shaft of the hub/spinner. Given the increasing popularity of 1/32 kits, which seem to be issued in ever greater numbers, the PropMaster seems to be an easy and painless method of assembling a large prop, especially if it is a resin prop. For multi-engine aircraft, there would appear to be greater certainty that both props have the blades set as nearly identically to one another as possible when using the PropMaster.. Thanks to John Vojtech of UMM-USA for the review sample. except Complete product image Copyright © 2011 by John Vojtech UMM-USA.